Toronto – Wilfrid Laurier University’s Faculty of Music and Randolph College for the Performing Arts (RCPA) are launching a unique Academic Pathway Agreement. This agreement will allow students studying in Laurier’s four-year Honours Bachelor of Music (BMus) program or RPCA’s two-year Performing Arts program to transition into the partner institution easily. As well, students admitted to either institution under this agreement will receive an automatic scholarship, renewable based on GPA. RCPA graduates can enrol in Laurier’s Honours BMus in Community Music or Honours BMus in Self-Directed Studies, to complete their bachelor’s degree with an additional two years of study. Third-year Laurier Honours BMus in Voice Performance students can enrol in the two-year Performing Arts College Diploma to graduate with both a bachelor’s degree and performing arts diploma. In both cases, applicants would earn admission to their respective programs through the normal audition procedures and be subject to the same terms and conditions as any other student. Laurier’s voice program is comprised of over 100 students, eight instructors and three professional coach-accompanists. Alumni are performing in the world’s leading venues, including the Metropolitan Opera, Carnegie Hall and La Scala Milan. Many graduates further their studies on scholarship at leading conservatories including, this year alone, the San Francisco Conservatory of Music and Manhattan School of Music. Randolph College’s Performing Arts Diploma offers an industry-focused acting (film, TV, and stage), singing (musical theatre), and dance (ballet, jazz, tap) curriculum in a conservatory setting over six intensive terms of study. “Randolph College is excited to work with Wilfrid Laurier University to offer this opportunity in arts education, which not only enables our respective students to follow their passion but also be even more competitive and thrive in an ever-evolving industry,” said Tara Young, CEO of the Randolph College. The official Academic Pathway Agreement will be signed during the program launch at Randolph College for the Performing Arts on March 6, 2019. In Laurier’s renowned Faculty of Music students are part of a family. The faculty’s reputation is built on outstanding students and professors, innovative programming and a welcoming and supportive learning environment. The Faculty of Music offers music programs at the bachelor’s, diploma and master’s levels. Laurier’s Faculty of Music is a national and international leader in higher music education, offering innovative, sector-leading programs including Canada’s only Master of Arts and Bachelor of Music in Community Music and Ontario’s only Master and Bachelor of Music Therapy. The faculty limits enrolment to roughly 450 undergraduate and 50 graduate students – a number that is small enough to give students ready access to their instructors, yet large enough to have a full symphony orchestra, three choirs, wind orchestra, an opera program and community music, jazz, chamber music, percussion and contemporary music ensembles. 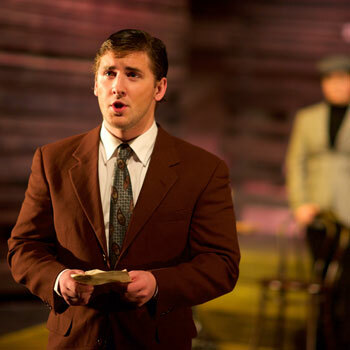 Since 1992, the Randolph College for the Performing Arts has transformed talented artists into multi-skilled performers through a rigorous training program that integrates the core disciplines of acting for stage, TV, and film; vocal; and dance, taught by a pre-eminent faculty of entertainment industry professionals. Faculty and alumni have appeared on Broadway, West End-London, Toronto, Stratford Festival, and Shaw Festival stages, as well as U.S. Tours and in feature films and TV series; worked with Disney, Cirque du Soleil, Vancouver Opera, Globe Theatre, Citadel Theatre, Neptune Theatre, Rainbow Stage, and Charlottetown Festival; and distinguished themselves as singer-songwriters, playwrights, directors, choreographers, producers and arts entrepreneurs. Randolph College for the Performing Arts is registered as a private career college under the Private Career Colleges Act, 2005.